We’ve had some stellar discussion in the forums over the last weeks or so. Be sure to review and weigh in! 1. Pricing – Strategy or “Just a Tactic”? – Should pricing be an integral part of a modern automotive marketing strategy? 3. Pull the Coke Ads! We didn’t sell enough cola in July! – We had a LOUSY May — cut the advertising for June! We have to save expenses! 4. Provoking a Used Car lead – No pics or no price night increase leads on the short term but what about the long term effect? 5. Re-Marketing. Trend or Long-timer? – What are your thoughts on display re-marketing? Dale Pollak Webinar – Monday July 11th, 2011 – Dale will be discussing mid-summer trends – where the market is at and where it is headed. In addition, I would like to invite you to participate in a Q&A. Click here to register. New Feature on the Forum – Like it! Being Liked is the new craze. 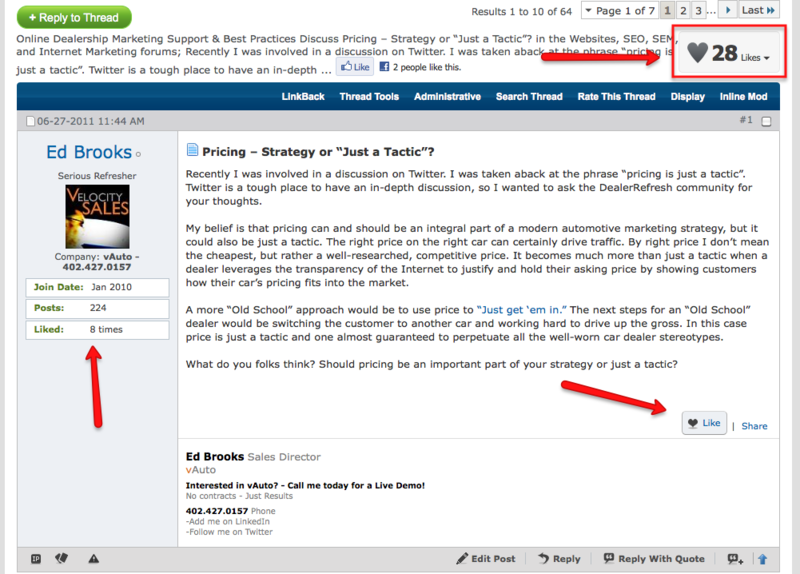 And for that reason, we have added a new “Like” feature to the DealerRefresh Dealer Forums. Read a thread that you like? “Like” it! A members comment helped answer a question you had? “Like” it! A community member shared some great insight? “Like” it! And don’t worry, this is an internet “Like” feature – it’s in no way attached to your facebook account. So you can like away without broadcasting it to all your facebook friends.